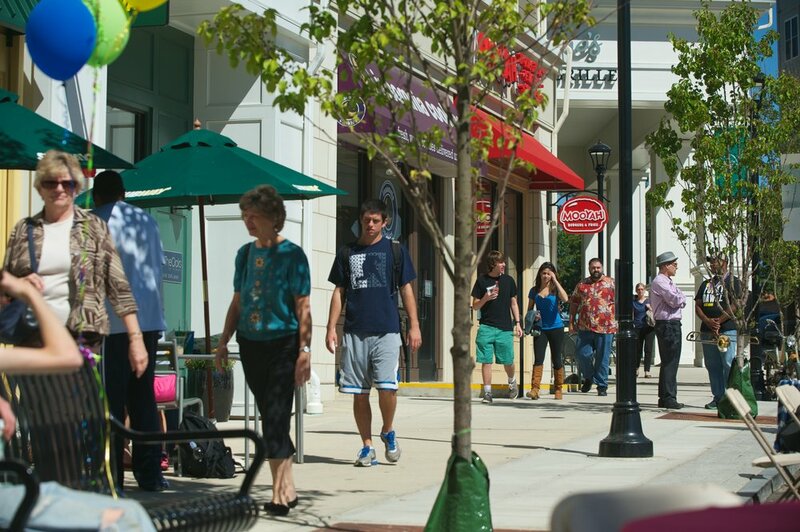 A place to shop, grab a bite to eat, just connect with friends, & even take a hike - Mansfield residents can do it all downtown! For many years, Mansfield residents had no place "to be" as a community. Downtown Storrs is now the community gathering place, for large events like the Celebrate Mansfield Festival, to friendly run-ins with neighbors while grabbing a cup of coffee. On the economic side of things, the new construction of the Storrs Center commercial spaces and The Oaks on the Square apartments has expanded the Town's commercial tax base. The additional tax revenue coming to the Town of Mansfield has helped keep residents' taxes lower despite the reduced state aide for the Town. The diverse downtown businesses not only provide shopping, dining, and recreational opportunities for residents, they provide work opportunities, too! The 80 businesses that call downtown home employ hundreds of residents, from high schoolers getting their first jobs to college students paying for school to doctors, engineers, & experts in their fields. But, it's not all business - Mansfield residents enjoy a variety of recreational activities and entertainment downtown, too! Two beautiful, preserved open spaces flank Downtown Storrs, offering residents and visitors a chance to take a break, take a breath, and enjoy the outdoors. The Town of Mansfield's Albert E. Moss Sanctuary boasts 135 acres and over 2 miles of trails, all right across the street from the Mansfield Community Center. On the east side of downtown, the Whetten Woods, a Joshua's Trust Property, offers over a mile of walking trails over varied terrain. The Jeffrey P. Ossen Family Foundation Community Playground, opened in 2015, is located behind the Mansfield Community Center. The playground is accessible to both children and caregivers with disabilities, with a "poured-in-place" surface that is easier to navigate than traditional playground surfaces. Nearby bus stops, the resources at the Community Center, and its convenient location in Downtown Storrs make this an attractive play option for families with children. Downtown Storrs is also home to the world-renowned Ballard Institute & Museum of Puppetry. The Ballard boasts a collection of over 2,500 puppets from all over the world and hosts workshops, forums, and performances year-round. In fact, Mansfield residents and visitors can explore a world of art and performance: The William Benton Museum of Art, Connecticut Repertory Theatre, von der Mehden Recital Hall, Contemporary Art Galleries, and Jorgensen Center for the Performing Arts are all within a mile of Betsy Paterson Square and easily accessible by foot or by bus.